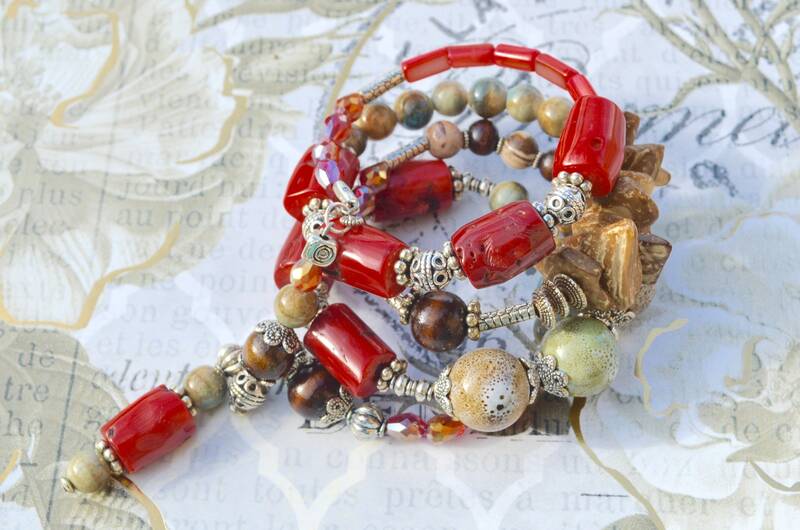 This beautiful bracelet is made of red bamboo, jasper beads, wood chunks,soapstone beads,silver and ceramic beads. It has two handmade charms on the ends. A beautiful blend of colors. It wraps around the wrist 4 times. These bracelets stretch to fit a wrist of 6cm - 7.5cm. All of my bracelets do. Most of the items I use to make my jewelry are the following: Semi-precious ukanite, hematite, jasper, agate beads & stones, czech beads, copper, silver, gold, howlite stone, shell, turquoise, glass/faceted glass, ceramic, wood, amazonite stone, soapstone, rose quartz, quartzite, crackle quartz stone and crystal to name a few. * I use stainless steel memory wire for all of my wrap bracelets. It’s very strong and will not break.